What is it? 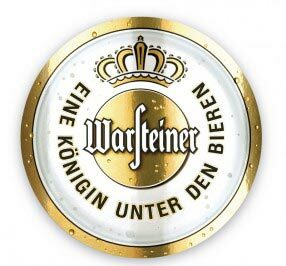 Warsteiner is a German brewery from – you guessed it – Warstein in North-Rhine Westphalia. It’s a privately owned brewery, having been run by the same family since 1753. On review is a 500ml can of the company’s Premium Verum pilsener, which has been imported to New Zealand. Apparently it’s the brewery’s best-selling beer and, according to Wikipedia, it’s available in more than 60 countries. That’s news to me, as I can’t say that I’ve ever encountered this beer before. But perhaps it’s because its packaging is so ‘meh’ that I simply haven’t noticed it before. Apparently in Germany this beer is known as “Premium Verum”. Can: I’m not a fan of the look of this gold-coloured can with a giant Warsteiner label. Sure, it looks suitably European – and I’d definitely give it a try if I saw it in an off-licence in Germany – but these days I don’t tend to buy my beer in cans, and I usually look for a beer that looks a bit more exciting. Nevertheless, I am a fan of German beer, so I’ll give this beer a try. Ingredients: Forest spring water, two-row malted summer barley, and German hops. The Warsteiner has a bitter finish, which I like, but overall the taste isn’t nearly as complex as, say, a Pilsner Urquell. I find it rather difficult to detect the hops in this one – they’re very subtle, buried beneath the grainy taste of the malt. There’s a slightly metallic taste, too, but that’ll likely be due to the fact this beer is from a can. Out of the can, the Warsteiner German pilsener pours a straw colour, with a generous white head. Is it the best beer ever? The Warsteiner is good but not great. To evoke the old cliché about German engineering – this beer is very proficient, but, for me, I find it lacks just a little bit of flair. It’s just too much like your typical German pilsner to really stand out these days – especially as more and more international beers are imported, not to mention the booming craft beer market. What else should I drink? If you see Warsteiner on your supermarket shelf, by all means give it a go. Perhaps I’ve been a tad harsh on it, because it is a very drinkable beer. If you’re looking for pilsner, you can’t go wrong with Pilsner Urquell. However, if it’s a German beer you want, I’d prefer one of the Deutschland’s many more exciting styles of beer – a doppelbock, say, Berliner Weisse, or a lovely German Hefeweizen (wheatbeer). When done well, these are far more exciting styles of beer than this German pilsner.